MP3 audio tracks can be easily mixed with MP3 free DJ software downloads, to help produce music similar to a DJ performing in dance night clubs. 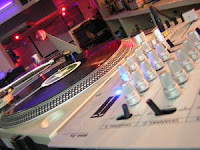 DJ functions for music mix creation, such as cross fading, beat matching, sound effects (e.g. reverb, echo, flange), and recordings can be applied to achieve a DJ mixed MP3 audio track. Mixing Deck By rubenshito at SXC. Listed are some free mixing software to achieve a DJ experience that you can hopefully enjoy. Best to search online for these DJ mixers, as not sure how long and which versions will remain free. Also note, their might be third party software (as I noted at one download site), for some DJ programs. So read carefully the installation user agreements, before deciding to install the mixing software. Also perform an anti-virus and spyware scan once you download the software. Mixxx 1.6.1: Performs on various operating platforms, for MP3 and other audio formats. Features include visual display, beat estimation, vinyl and MIDI inputs, with user keyboard and mouse control. Zulu 1.0: Drag and drop audio within the software, to generate auto beats per minute and tempo change to achieve synchronization. Various DJ functions such as auto and manual beat input, cue marking for start, USB Console support, effects (e.g. delay, reverb, flange) and more. Supports MP3 WAV, OGG, and other audio formats. Seems to be a good download. otsAV Free: Free DJ mixer version of the professional software version, for beat creation, fade mixing, dynamics processing, with video mixing and karaoke. You can produce your own MTV music channel with a bit of customization. Has plenty of functions - manual override, time scaling, scratching, pitch, and more. Decks 1.20: Can record to WAV format from MP3's, after beat matching and cross fading audio. Create a CD compilation from this easy to use DJ software download. KraMixer: DJ software to mix MP3, WAV, and OGG audio formats, and records to MP3 format. Includes automatic bpm counting, loop counting, effects (e.g. echo, reverb, flange, etc), and other features, all operating from it's fast sound mixing process. MixVibes Free 5.2: small DJ software download (1.5 MB) to play and mix your MP3 tracks. Supports common audio formats, with controls for bass, treble, pitch, BPM, and more. TRAKTOR DJ Player 1.11: Audio player to play mixed music, and has auto mix mode to merge MP3 or CD tracks by applying fade modes. Control the cross fader for music interaction, after audio tracks are dragged and dropped to arrange in a play list. Image of Urban Scratching By phaser4 at SXC. DJ Workstation 0.5.3: Small free download software for simple DJ mixing of MP3 tracks. Noted as being small and fast. UltraMixer Free 2.3.7.1: DJ mixing software download for CD's, MP3's, WAV, OGG, WMA, and other audio formats. Includes ACC/M4A support, calculate a track's bpm, but requires manual track synchronization. Has auto DJ for tasks, apply fade and effects for two tracks, on a well designed intuitive interface. Use short cut keys, play lists can be saved, and track history can be saved. OpenSebJ: Real time audio sample mixer software that can load 255 audio samples (WAV), with a composition function with looping. Allows keyboard to audio sample linking for playing, with property adjustment (pan, frequency, and play), movement of a "virtual needle" (cursor movement), pitch shifter roll, and audio can be saved. Mixere 1.0.83: Open source software for audio file mixing, and suited for live performance for creating multi-layered sound collages. The interface represents a spread sheet pattern, with rows of tracks and columns for adjusting each track (e.g. mute, play, pause, pitch, pan, position, etc). Convexsoft DJ Audio Mixer: Comprehensive DJ mixer with two independent decks, with fast seeking, pitch control, and display of beat-syncs. Has 10 band equalizer, multi play, with skin interface changeability to enhance DJ mixing. Free Audio DJ Mixer 2.0.0.0/3.0.0.o: Apply various DJ and sound effects to your MP3 or WAV recordings which can be saved. Includes volume control for each track. SC Free Audio DJ Mixer 1.2.0.1: Comprehensive DJ software download, with a range of features to produce quality MP3 or WAV mixes. DJ functions and features include drag and drop of audio, beat matching, cross and auto fading, looping, graphical output, cue points, turntable simulation, recording, play list, boost, pitch, and much more. Image of SC free Audio DJ Mixer. Hi thanks for the share. would u like to exchange link with my blog. I have just bought a new karaoke system and am just setting it up, it's mostly for my wife though but as per usual I have to know how it all works.would it be better to buy karaoke software and connect via the PC or just get a backing track CDG? Lots of nice information provided here for DJ. Great. I will suggest this post to other DJ. Because many softwares and collection here for DJ.